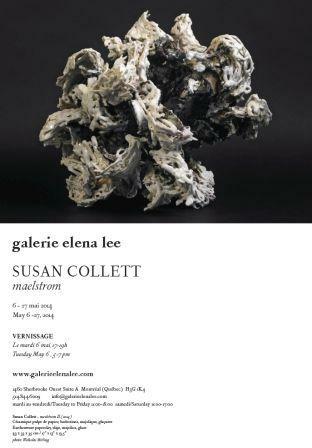 If you are in Montreal over the next couple of weeks, May 6-27, be sure to to stop in at the galerie elena lee, 1460 Sherbrooke St. W. , Suite A.
Toronto-based ceramic sculptor Susan Collett will be exhibiting works from her latest Maelstrom and Maze series of sculptures. Gallery hours and exhibition details can be found at the gallery link above or by phoning 514-844-600. This entry was posted in Exhibition, Ontario, Sculptural and tagged exhibition, sculpture, Susan Collett on May 1, 2014 by Barry Morrison.